You know when you are doing laundry and everything comes out of the dryer all warm and fluffy and smelling amazing and you just fall asleep in a pile of clean clothes on the couch? Nope, just me? Oh well. While that might not be a common practice, throwing in a dryer sheet or adding a splash of fabric softener is pretty common. But, have you ever wondered how one of those rather small dryer sheets works to get rid of the static for a whole load of laundry? Well, the answer often comes from many added chemicals. 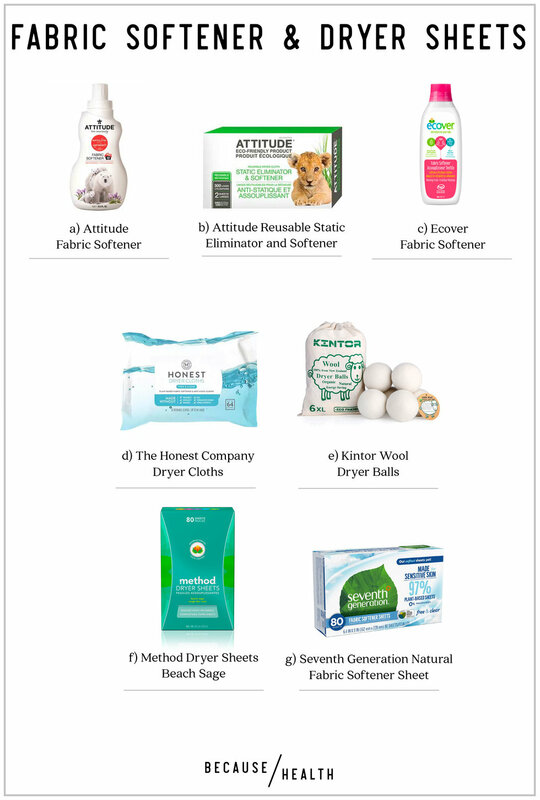 Next time you are doing a load of laundry (with some safe laundry detergent), check out one of these option instead. They will keep your clothes looking good without the potentially dangerous chemicals. All of the ones we recommend are widely available, have positive reviews, and have been checked for safety from a third party. We rely on EWG's consumer databases, the Think Dirty App, and GoodGuide in addition to consumer reviews and widespread availability of products to generate these recommendations. Learn more on our methodology page.